A few weeks ago, Sean and I got back from a trip to the UK, where we went to see my best friend Anna get married in a big country house that allowed everyone involved—though predominantly, I am coming to suspect, only me—to pretend they were living in a real life episode of Downton Abbey. Afterwards, we took advantage not only of England's convenient budget airlines but also of its convenient proximity to everything else, and flew to Germany for a few days. We spent a day and a half in Munich and three days in Berlin, and on the second day in Berlin we rented a car and left it. It was part of a grand plan, you see, to dig a few generations back and discover a little bit of my past. My paternal grandfather Bob—which wasn't really his name but everyone called him that anyway because his last name was Burns, like the poet Robert Burns, which I guess makes as much sense as anything—had been, essentially, a spy in World War II, employed by British Intelligence and posted to the north of Germany so that he could weed out Nazi sympathizers in bars. His job—and this was a great job for him, because he was also, essentially, an alcoholic—was to sit in the pub all night and make friends. The next day he'd have these friends arrested, of course, based on what they'd drunkenly told him the night before, but this is the way they did things in the 1940s, I think: put a sociable English soldier who speaks perfect German in a local watering hole and have him buy everyone drinks all night. Boom, the next day you've got your man. My German grandmother, then a young twentysomething living in Hannover with her parents and sister, was working as a translator after the war. They met, married, and moved back to his native England. She left all of her family behind. Now for someone like me, who has always been hopelessly nostalgic and who has always felt fairly rootless, stories like this are like precious heirlooms, treasured the same way you'd wrap a pair of pearls in an old hankie and take them out every so often to look at. Growing up, I was very close to my grandmother—probably owing to the fact that my parents were often living thousands of miles away, but also, I think, because she was only the second person to see me after I was born ("that'll do very nicely," she's said to have said)—but it's only in the last five or six years that I've started thinking about wanting to see where she grew up, where she lived and worked, and where she and my grandfather took my dad and his siblings on family holidays back to Germany in the 1950s and 60s. Berlin is only two and a half hours from Hannover. Everything sort of just came together. There were four stops on our itinerary: my grandmother's old apartment; a cafe in downtown Hannover with a lot of family history; the house that her father, my great-grandfather, had built in nearby Empelde after the war; and the city of Braunschweig, where I had arranged to meet an uncle—really, a second cousin of my dad's—that I'd never met before. All of this in a foreign country, driving a foreign car, on foreign roads, with a foreign GPS whose staccato commands were an instant crash course in the high school German that had been lying dormant in my brain for the last 14 years. Exhibit A: Our German GPS showing the address we were going to. Exhibit B: The address in question, found on my grandparents' 1947 engagement announcement, which was tucked into the back of an old photo album. The day was frigid and rainy and we didn't see the sun once. (We didn't actually see the sun once the entire time we were in Berlin, but that's what you get for going to Northern Germany in January, Holly, think about that the next time you marvel at how cheap the hotel rates are this time of year.) We arrived in Hannover two bracing, slightly frightening hours later—someone was a little enamored of the no-speed-limit-on-the-Autobahn thing and pushed us, at one point, up to 136 miles an hour, at which point someone else screeched that she hadn't come all this way just to get into a fiery auto wreck, particularly not before trying the famous Apfelkuchen at the aforementioned cafe in Hannover—and found ourselves at the address on the 66-year-old engagment announcement just after noon. We couldn't go inside, of course, but it was enough just to stand in front of the apartment building, to walk down the same street my grandmother would have walked down as a child and a teenager and a twentysomething, to know that my feet had touched the pavement her feet had touched, that my nose had pressed up against the same glass she'd have looked out of from the lobby door. Her name wasn't there anymore, of course, but I liked knowing that it would have been. Mission accomplished, we drove five minutes into the center of Hannover, grappled with the public parking situation—this is exactly the kind of thing they prepare you for at school-level German and exactly the kind of complicated vocabulary you instantly forget—and made our way to the Hollaendische Kakao-Stube, a cafe my dad had urged me to try and find if I could. My dad's grandmother—my great-grandmother—had known the proprietor, Friedrich Bartels, back in the day, and she'd often taken my grandmother there as a child. After it was bombed in the war and rebuilt in the same style, my courting grandparents would go there in the 1940s, and when they took my dad and his siblings back to Germany in the 50s and 60s, they'd bring them here for a treat. "Have coffee and a naughty cake," my dad wrote in his email to me. 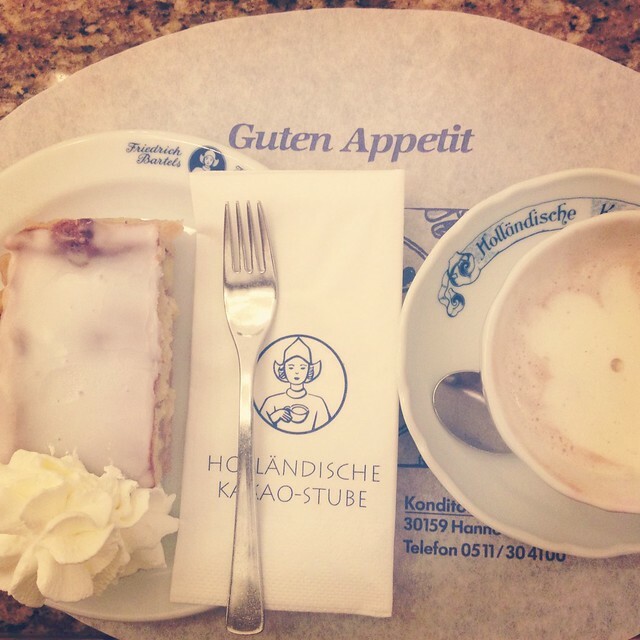 "If they have Apfelkuchen with Sahne, have that. It was Omi's favorite and it's mine too." Well, just following orders, I guess. Here is Sean in front of the Hannover Opera House. Our car was parked somewhere beneath it, possibly illegally. Full of apple cake and Hawaii-Toast, we drove the 20 minutes to the nearby village of Empelde, where my great grandfather had built a house on an empty plot of land after the war. Together with his wife, Angelika, he lived on the ground floor of the house; my great-aunt Leni—their daughter and my grandmother's sister—lived on the top floor with her husband, Harald. Here is Leni standing in front of the house in the late 1940s. And here is the house as it looks today. Gone are the fields and vacant lots; now it's surrounded by houses and shops on all sides. While my dad had told me lots of stories about this house and shown me lots of pictures, he couldn't remember an exact address for it, just that it was "two down from the church and across from the tram station" (try telling that to a German GPS.) When we first found the house—or what I assumed was the house—I took a few tentative pictures from the front, fairly certain I was in the right place, but not completely confident and slightly wary I might be taking random pictures of the wrong thing. Then, on impulse, I took a few steps down the side street, until I could see it from the back, and suddenly—it hit me like a lightning bolt—I was sure. When I turned the corner and saw the back of the house, there it was, right in front of me: the balcony. My god, that very same balcony. I know it sounds silly, but it was a bit of an emotional moment for me. How many times had I looked at that balcony in grainy black and white print on my wall, and suddenly there it was, more than a full half-century later, empty but for old ghosts. Above it were the windows of the attic room my dad and his brother would stay in every summer, my dad hiding the pickled herring he hated down the side of the mattress until, weeks later, the smell made everyone suspicious. Well, it's certainly a lot safer. Our final stop of the day was the town of Braunschweig, about an hour away, where my Uncle Harald and his wife Thea ensured that we had, in this order, afternoon coffee, afternoon cake, a thorough tour of the city, and a wonderful home-cooked dinner of Currywurst—all in the span of about four hours. We also visited Harald's mother, Rosie—my grandmother's cousin—who is 86 and still lives in the same house she moved into as a child in the 1930s. This is Harald sitting in the same room, on the very same couch—in the very same spot on the couch, as a matter of fact—as he did in 1966, when his brother Hans Peter, my dad, and my dad's brother Gordon, watched the 1966 World Cup Final together. England beat West Germany in the last few minutes of the match, which, as you can imagine, was very exciting for my dad and Gordon, and not so exciting for Harald and Hans Peter. My dad saw this picture the other day and said absolutely nothing about this room has changed in the intervening 47 years. Well, okay, maybe there was no remote control on the table back then. But ALMOST nothing. So that was my day of nostalgia tourism in northern Germany, and it was probably my favorite of the four-and-a-half days we spent in the country. We saw other wonderful and memorable things, of course—which I'm sure I shall get around to writing about in the next, ooh, three months if my track record is anything to go by—but there was something special about this day that made it stick out head and shoulders above all the rest. It was like time travel, maybe. Like reaching back into the past and recreating it, if only for a brief few moments. Like having the magnificent power of resurrecting history, one passed-down story at a time. What a wonderful trip! I would love to do something like this one day! "the magnificent power of resurrecting history" Absolutely! This has fired me up to investigate my own! Lovely as always, Holly. This has left me in absolute tears! My paternal grandparents came to California sometime in the late 50's from their hometown of Kaiserslautern and while I have been to Germany I have never made the trek to Kaiserslautern and would love to see and experience their hometown as you did your grandmothers. It's funny, my great grand mother was from Kilkenny but I have never had the desire to track her down like this. I've been to Europe several times and it's never crossed my mind to get to IReland and check it out. Good for you for braving the cold of January to check this all out! I've been to Germany in the winter and it is no picnic. And your pictures look just as dreary as I remember! Hawaii-Toast was very popular in Germany back in the 80´s, as was Melba-Toast, which would have been a tinned peach instead of the pineapple. I would have been curious how that house of your great-grandfather looks like inside now and I would have shamelessly knocked on their door. Maybe they would have known your family. So excited to see a post from you this morning. Seriously. I MISSED you. In a non-creepy way. I practically screeched at my boyfriend for going 95MPH on the highway in Florida, where everyone acts like there's no speed limit. You are much braver/tolerant than I am. I loved reading this SO MUCH. I get the same sort of feeling when I go back to where my grandparents grew up in ... okay, FINE, northern Indiana, so not quite as exciting, but it's the only place where I feel I really have roots; where I can see where they lived as children, where they held parties, where they golfed. One day, when we do a big Europe trip, I'll have to see if I can find any of the addresses for older ancestors -- this just gave me chills. I LOVED reading this and think it's so cool that you took this trip. I think you and I are very similar when it comes to family history and nostalgia. This is so beautiful. I agree with you, I love history so much. Especially when that history is so personal. Good for you! I loved this post! I love looking at old pictures and then to "time-travel" to the present to see what they look like now is so much fun! How awesome to spend time with some of your family as well. Thanks for sharing. I'm incredibly jealous. I've been daydreaming about traveling to Germany for these exact same reasons. Family has told me there's a castle there with the same name as my mother's maiden name. I hope to take my kids soon. With a name like "Ginter" you know I've got some thick German roots! I really enjoyed reading this - my mother was from near Braunschweig, so it was fun to remember some of the towns you mentioned from going over there as a kid. I'm with you on wanting to see where your family grew up, there's just something about it! How wonderful to have been able to go see all of this in person! Just the coolest history lesson, even for those of us not in your family. (Especially the bit about the semi-alcoholic spy...do you think that's still a job? I'll check it out and get back to you). I also loved reading this! Holly, I’m guessing your middle name comes from your great-grandmother. The past and present photos were such fun to examine and see the similarities. Must have been even better in person. Hanging out in a pub and then arresting people in the morning?? Coolest Grandpa ever. Great story, Holly, thanks for sharing! I wish my family had places to visit like this! Aynsley: Yes! Exactly. I'm named after her. For most of my life, I thought it was deeply uncool (I'd tell people my middle name was "Angela" instead, or sometimes even "Angel" in my 13-to-14-year-old phase), but now I absolutely love it. I love this. I love every word of this. Your pictures, your story, it all feels like home. My opa was in the American Navy during World War 2; his brother was unfortunately on the other side. After the war, he and my Oma moved their two daughters back to Wiesbaden, raised them in German schools and culture. Years ago I traveled back and got to see all the places my mother had lived, got to see the deli they bought breakfast rolls from, the place where my opa found a "Guht Fahrt" sign (which now hangs mischievously in my kitchen). I've only been to Germany a handful of times, but (perhaps because my mother and Oma have passed bits along) it has always felt like home. Absolutely, absolutely loved reading every word of this post. I must say you are brave. I go all teary just at the thought of visiting my late father's village, which my mother visits almost every year, but I haven't in a decade. There is so much history and unexpected emotion in every nook. Also, I'm a little scared that the places I remember might have changed or (horror of horrors) ceased to exist. A number of people I knew (including a cousin my age) have passed away and I'm just so scared that I'll stir memories and end up making them painful and dark. You're so brave, girl. Looking forward to the rest of the stories from this trip. This makes me really sad that the roots we have traced back 200 years or so all lead to...Tennessee and Alabama. Exciting, exciting (NOT...I would love to go on this crazy tour of northern Germany in search of my own heritage! I mean, my grandparents' name WAS Hausholter, so surely there is some bit of German history there). This is my favorite post to date! My heart was seriously pounding over the balcony in your grandmother's photo. What an amazing experience. Thanks for sharing! It was such fun reading this and also a little odd, because your whole tour took place in the area where I live today (I am actually from Hamburg). I can totally understand your love for researching and reaching back to the past. I always insist on hearing stories about my ancestors, when I visit my grandparents. Due to the two World Wars and the general shifts of borders over time in Europe, almost every family has roots in other countries and amazing stories to tell. HANS PETER! The names in this story alone are so evocative of another era. I'm so glad I waited until I had a nice quiet moment to really absorb this. Lovely writing and such a transporting post. I LOVE stories like this, Holly! When was in Prague, I went on a similar journey though I didn't have much to go on except what I learned from Ancestry.com. There's nothing like that *aha* moment when you realize you're standing exactly where your ancestors stood! What a wonderful journey you got to have. I'd love to do this one day as well. I'm adopted (and know my birth family) so I would have to decide which line I'd want to search. I will be in Luxembourg sometime in the next year... perhaps I'll have to make a little side trip. I just knew if I kept coming back you'd eventually have posted something brilliant here, and I am not disappointed. Also chuffed to find out that you also have German ancestors, as do I. Sadly, the only trip I've ever made to Germany to see my many relatives, including the aunt I was named after, was when I was "in utero" - my mom and dad went there for a week when Mom was pregnant with me. I would love to go... thanks for sharing your trip, and I couldn't agree more with your comment about cruises vs. going to Europe and revisiting history. I'll take Europe and history ANY day. I've been in Berlin for a few months now and one thing I've learned is: no one comes to visit you in the winter. That said, we did see a little sun today. On another note, that GPS just looks German. Purely functional with no fancy graphics or anything to make it look nice. This post gave me goosebumps. I love your writing, and I love to know I'm not alone in my craving for pieces of my heritage. I adore stories and photos like this! Thank you for sharing! I'd seen the photos in your photostream and had a little frisson of anticipation for what story might come! Long time lurker, first time commenter! This post is wonderful. You are so fortunate to be able to trace your roots. I am going to trawl through our old family albums next time I am home at my parents - perhaps it will inspire me to do a similar trip to India. Also, is their a virile rail connection between the two cities to Braunschweig. I am going to Braunschweig, but intends to fly from London to either Berlin (Shonefed) or Frankfurt (hahn) or Hamburg (Lubec) or Duseldorf (weeze). Which is the best connection to Braunschweig, interms of rail connection?